15 tins contain all the spices, herbs, and blends to make five knockout dishes from around the world. 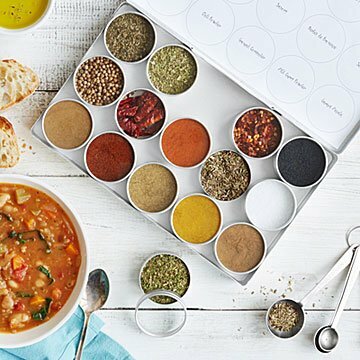 If you think of chili and stew as satisfying if unexciting staples, it's time to rev up your tastebuds and vrooom around the world with Julie Pedersen's globally inspired seasoning kit. The 15 tins contain all the spices, herbs, and blends you need to make five knockout dishes, including Irish Stout Beer Chili, Indian Cashew Chili, and African Peanut Stew (recipes included). An inspired gift for foodies and entertainers who love experimenting in the kitchen. Assembled in Canada. Looking for more globally-inspired dinners? Try our Global Pizza and Global Taco seasoning kits! Amazing but was missing recipe book! As I stated before I love everything about this gift! The sole reason I am giving it 4 stars is my kit did not come with the included recipe book. There are a few items that I have had a harder time trying to use in my own cooking because I have never used them before. If I could get the recipes intended for the kit that would alter my entire experience and this would have been a 5 star order. It's called "Global" seasonings, so I expected it to be a little more exotic. But it's full of stuff you probably already have in your kitchen. - pepper, sea salt, cumin, oregano, and basil!!! It's my fault for not reading thoroughly. As a gift set, it is nice. Which is why I gave it three stars and not one or two as I was initially tempted to do. Perfect for people that appreciated good and natural foods.